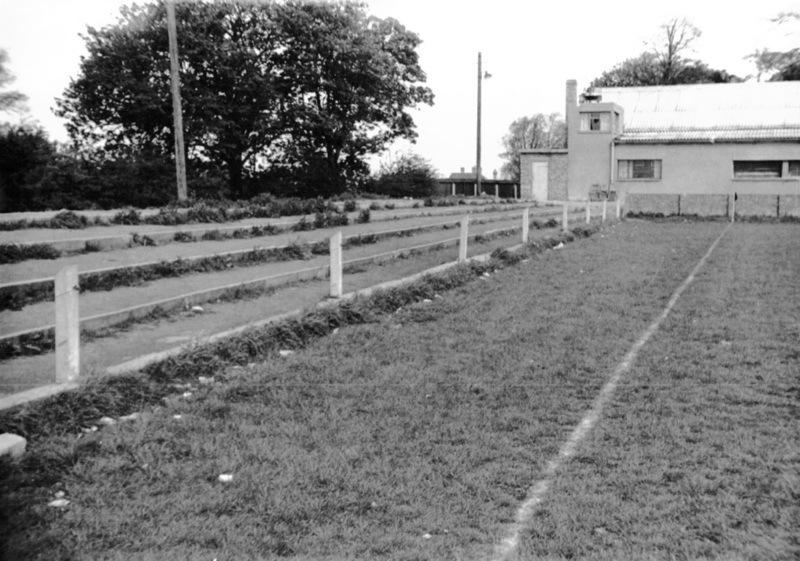 The uncovered Habbin Terrace of the 1950s familiar to Neil Hudson, with the Supporters' Clubhouse in the corner. Photo: the Swainland donation, Cambridgeshire Collection. Neil Hudson says his memories are fading. There is no evidence of that in these reminiscences. My first memory of the Abbey Stadium was in the 1950s. There was no Habbin Stand in those days, just a line of railway sleepers to act as terracing. I remember one game with my father when they must have opened the gates up with ten minutes or so to go. This bloke wanders in from the allotments across the way, pipe in his mouth, garden fork in one hand and a lead with his spaniel attached in the other. The dog thought this was great fun, but I have a feeling this would not be allowed today. What would Van Gaal have said? ‘Ze doggie err was very frightening and err barked at our players and err frightened them err away from one err side of ze pitch, the tripody err thing was an offensive weapon and his mouth bonfire blinded our players who are so much better than yours’. I also remember, or seem to, standing watching a game on a Christmas morning in that decade. Perhaps I dreamt this, though. And then in the mid-1960s, in the summer, three of us were having a bit of footy practice on Cherry Hinton Rec. Three blokes came up to us and asked if they could join in for a bit of a kick-around. One was Billy Wall, another was Wesley Maughan and I think the other was David Barrett (younger readers may want to ask their grandparents who these characters were). After all the times Billy had terrorised us playing for City (he came across to us at the Abbey in the end), I thought I would get my own back and give him a kick. I spent the whole of the little game staring into the distance and thinking ‘where's he gone now?’ I was turned on a threepenny bit every time and in a flash he was five yards behind me. Time moves on. When I was at Aberystwyth University in the mid-1970s, a nice day out was to go down to Swansea, 60 miles away. My father used to send me the Light Blue every week (again, younger readers may like to ask their grandparents what this was) and I knew the U's were playing there on a certain day. road). It was quite a sunny late winter’s day when I announced to Helen: ‘Looking in the paper just now, I see Cambridge are playing here tonight.’ ‘Did you have this planned?’ ‘No,’ (liar). I will swear to the great referee in the sky that I was the only U’s supporter there on that miserable Tuesday evening, and we went and hid right up the corner. We equalised at one point, and there was complete silence. There were only 1,500 there that night and we lost 1-2. I had been to the Vetch Field some years earlier when Wales were playing Northern Ireland. Those were the days when it was a privilege to represent your country and everybody did – and their managers didn't stop them. George Best was playing, and he was useless. There were 27,000 watching and all the women screamed every time he got the ball. Thanks to our European colleagues, we now have a non-contact sport. And with the advent of close-up camera work no misdeed can be missed. 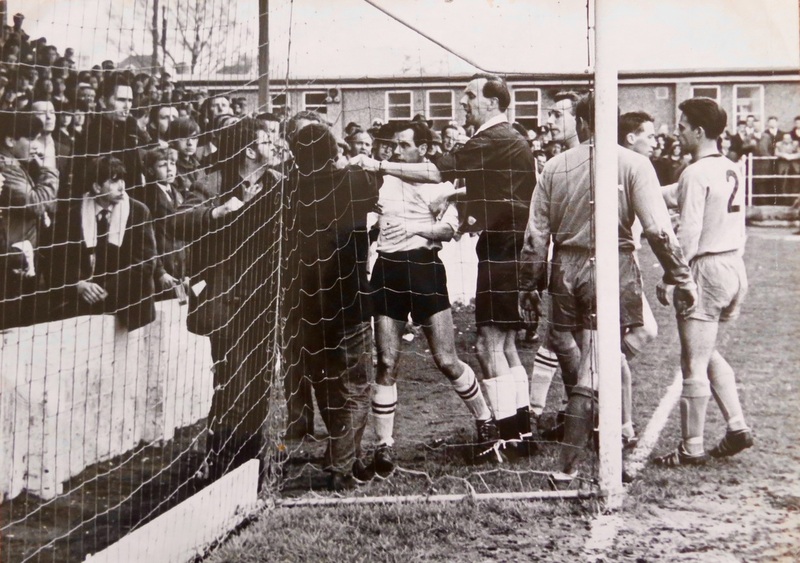 Back in the 1960s there was something almost refreshing about a punch-up in front of the referee. Some of us will remember certain games with Cambridge City (who always thought they were better than us; who’s laughing now?) – fist fights in two games, with spectators leaping on to the pitch to join in and at least one game abandoned. There was a certain City defender who often seemed to be behind these flare-ups. I can't remember his name – does anyone else? I also remember a referee called Kirkpatrick. He was, shall we say, a bit overweight, but he charged up and down like a rampaging bull. He was often the best source of fun during a boring game. Some of us regularly went to City’s ground at Milton Road when the U's were away. We always supported the other side, of course. Milton Road was great: you could get a pint of beer when you were only 16. One day we were standing behind the goal when a City player got injured in the penalty area. We all cheered and the referee came over and told us off. Both Cambridge teams had great and wonderful players in the past: City had Eddie Bailham and United, earlier, had Wilf Mannion. Both were internationals and joined non-League teams under strange circumstances. The likes of that will never happen again. As I say, fading memories, but I don't think they have faded that much.